The photomosaic that forms the base for this globe was created by merging two global digital image models (DIM's) of Mars, a medium-resolution monochrome mosaic processed to emphasize topographic features, and a lower resolution color mosaic emphasizing color and albedo variations. The medium-resolution (1/256 or roughly 231 m/pixel) monochromatic image model was constructed from about 6,000 images having resolutions of 150-350 m/pixel and oblique illumination (Sun 20 ° -45 ° above the horizon). Radiometric processing was intended to suppress or remove the effects of albedo variations through the use of a high-pass divide filter, followed by photometric normalization so that the contrast of a given topographic slope would be approximately the same in all images. The global color mosaic was assembled at 1/64 or roughly 864 m/pixel from about 1,000 red- and green-filter images having 500-1,000 m/pixel resolution. These images were first mosaicked in groups, each taken on a single orbit of the Viking spacecraft. The orbit mosaics were then processed to remove spatially and temporally varying atmospheric haze in the overlap regions. After haze removal, the per-orbit mosaics were photometrically normalized to equalize the contrast of albedo features and mosaicked together with cosmetic seam removal. The medium-resolution DIM was used for geometric control of this color mosaic. A green-filter image was synthesized by weighted averaging of the red- and violet-filter mosaics. Finally, the product seen here was obtained by multiplying each color image by the medium-resolution monochrome image. The color balance selected for images in this map series was designed to be close to natural color for brighter, redder regions, such as Arabia Terra and the Tharsis region, but the data have been stretched so that the relatively dark regions appear darker and less red than they actually are. 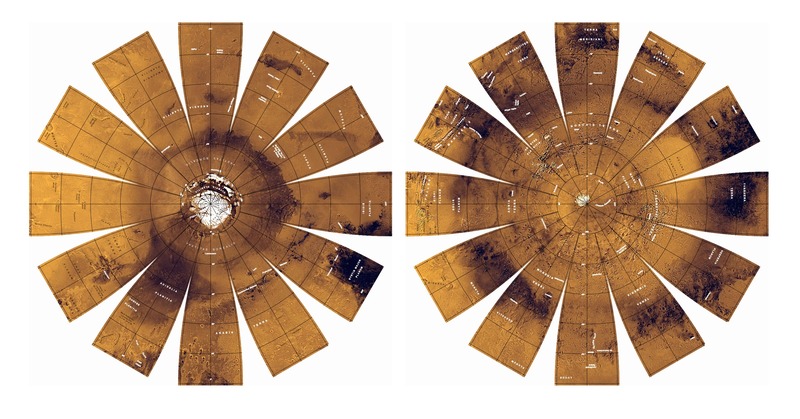 The images are presented in a projection that portrays the entire surface of Mars in a manner suitable for the production of a globe; the number, size, and placement of text annotations were chosen for a 12-inch globe (shown above, center image, 23 kB). Prominent features are labeled with names approved by the International Astronomical Union. A specialized program was used to create the "flower petal" appearance of the images; the area of each petal from 0 to 75 degrees latitude is in the Transverse Mercator projection, and the area from 75 to 90 degrees latitude is in the Lambert Azimuthal Equal-Area projection. The northern hemisphere of Mars is shown on the left, and the southern hemisphere on the right.